At UD, Prof. Thomas H. Epps, III and his team have patented an idea to improve lithium battery performance. Imagine a world where cell phones and laptops can be charged in a matter of minutes instead of hours, rolled up and stored in your pocket, or dropped without sustaining any damage. 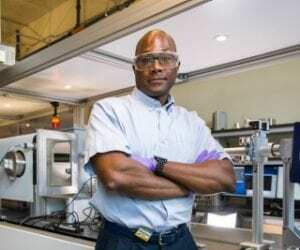 It is possible, according to University of Delaware Professor Thomas H. Epps, III, but the materials are not there yet. So, what is holding back the technology? For starters, it would take more conductive, flexible and lighter-weight batteries, said Epps, who is the Thomas and Kipp Gutshall Professor of Chemical and Biomolecular Engineering and a professor in the Department of Materials Science and Engineering at UD. The batteries would need to be more impact-resistant and safer, too. In May, an e-cigarette exploded in Florida and killed a man. Evidence reportedly suggests that this unfortunate accident may be due to battery-related issues, according to the U.S. Food and Drug Administration. Similar problems have plagued devices like the Samsung Galaxy Note 7 and auxiliary power units of the Boeing Dreamliner. “All of these challenges came from batteries that have safety and stability issues when the goal is to push performance,” said Epps, an expert in designing and fabricating conducting membranes useful in energy generation and storage devices. One way to overcome this challenge in the lithium-ion batteries for the above devices is to improve the battery membranes — and the associated electrolytes — that are designed to shuttle the lithium ions, which offset the electrical charge associated with charging and discharging the battery.